I have to share with you one of my very favorite soups! Even though I'm not Italian, I do LOVE Italian foods. This Lasagna Soup recipe is perfect for warming your heart and soul. I hope you try it! I'm using my Olde English Countryside teacup, by Johnson Brothers. Do I really use all these pretty teacups? Yes, I really do! Every evening I drink a cup of Sleepytime tea, which is so soothing. This soup is really quick, and oh so flavorful! The surprise of fresh mozzarella cubes in the bottom of the bowl gives the soup a cheesy richness. Oh, yum, Kitty! What a perfect comfort winter food this would be. I even think my Italian husband would eat it - and he seldom even takes one taste of soup....not sure why, but this one sounds hearty and flavorful! TYSM! I'm a HUGE fan of Italian food so your lasagna soup is right up my alley. Thanks for sharing, Kitty! 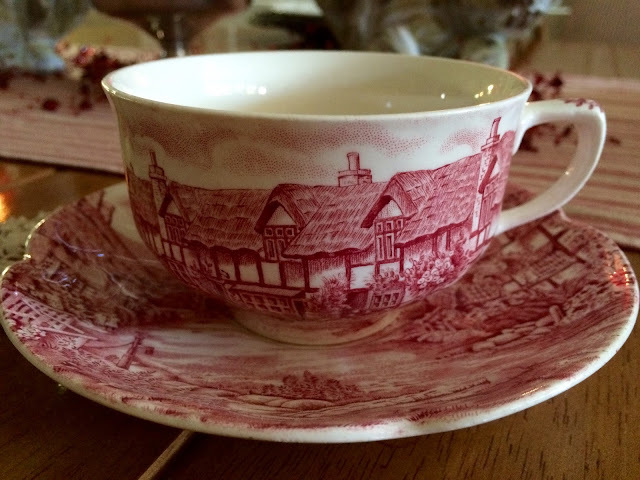 I'm also loving your red transferware teacup and glad that you use your pretty teacups on a daily basis. I totally agree as tea tastes so much better in a tea cup with that English Scenery on it! Yesterday at an antique mall they were having an anniversary sale and offered treats. I made a cup of Peach Tea in a strofoam cup and it even tasted really good! Your soup looks delicious. I have never made Lasagna Soup but will print your recipe as I have been seeing quite a few recipes lately and need to try this! Lovely post! I do love soups in the winter. My favorite Italian Soup is Zuppa Tuscano (like what they have at Olive Garden.) But this sounds like something I should try too. Thanks for posting it. Oh that sounds good all made from scratch that way. I have a lasagna soup recipe that begins with an actual lasagna. A wonderful presentation in the tea cup. This soups sounds delicious and very comforting. I needed a bowl or two this weekend as were freezing here. -1 degree early Sunday morning. I love the heart shaped bowl. Sounds delicious! I love soup - especially in the winter - it's "comfort food!" Thanks for sharing the recipe. Yum, I love Italian food too although I am not Italian either. I think I would have to use hamburg though because I can't tolerate sausage, as flavourful as it would be! I love a spicy soup, spicy anything really, so I really would enjoy this. Thank you for sharing the recipe, Kitty. Sounds delicious! Oh, how did I not comment on that teacup! LOVE it as you knew I would. Such a pretty pattern. Hugs. I am absolutely going to make this, Kitty. We love Italian sausage in just about anything and I'm always looking for a new soup recipe. This soup sounds delicious! It would be perfect for this cold storm evening. 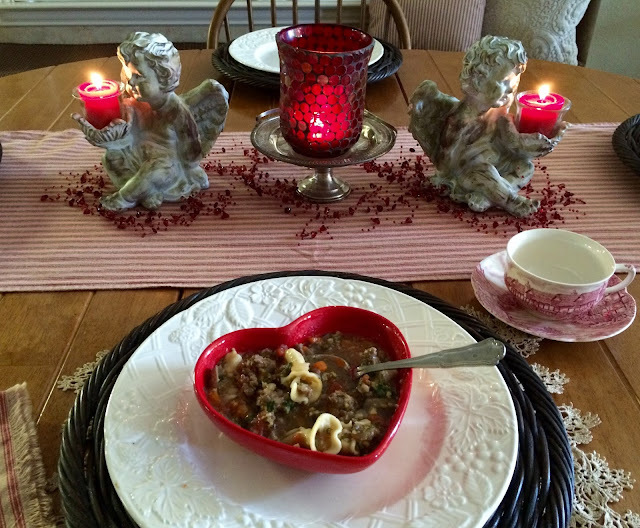 Love your teacup, just beautiful……..
A yummy looking soup and love the heart shaped bowl for serving Kitty. I've been meaning to ask you, have you found the cinnamon chips recently? My daughter looked in Michigan and I've not seen them in Florida this year. Hopefully they weren't just a passing fancy from Nestle. Kitty, that soup sounds wonnnnderful! And the presentation is, of course, both elegant and homey. Such a beautiful table setting and you always have the most beautiful tea cups and saucers. Do you find that the Sleepytime Tea helps relax you and or sleep? I have such difficulty going to sleep as well as staying asleep. The soup looks and sounds delish! I love Italian sausage so will definitely be making this. Thanks so much for sharing the recipe! Love your table setting with the yummy lasagna soup! What a great idea to put mozzarella cubes in the bottom of the bowl for extra cheesiness! I love Italian food so much, I am going to save this recipe and give it a try. It looks simple, easy, and yummy! :) And your lovely tea cup is darling as well! Hello Kitty, Mmmmmmmmm, your soup looks so good I can almost smell it : ) Thank you for sharing the recipe. Your Countryside cup is wonderful! I love that pattern. I have a couple pieces of it and love it. Wishing you a beautiful week. Definitely a delicious lasagna soup. This would be an awesome soup for everyone. I'm gonna usesargento natural cheese with this recipe. Wow this soup sounds so good and I love that pretty bowl. I will have to give this a try. Thanks for sharing this recipe at Cooking and Crafting with J & J. Wishing you a wonderful week. We are big on soups at our house so I am goig to share this one with the head chef. The soup sounds delicious and perfect for these cold winter days. Wow this sounds and looks delicious. Doesn't sound too hard either so I like that! Thank you so much for joining our second Thoughts of Home on Thursday party! This recipe is a keeper, and I can't wait to try it. My husband, son, and I would love this one so thanks for sharing, sweet friend. Thank you so much for sharing with Roses of Inspiration. Hugs and much love to you! I imagine my Italian hubby would love this recipe. i love your cup and saucer too. I use mine too! Why have those lovelies if you don't use them? This soup could be a whole meal. It sounds delicious. This yummy soup looks so easy and delicious. Kitty, I will be featuring this post at No Place Like Home on Monday. Enjoy your weekend. Soups are such a staple at our home and I am always searching for new recipes. We love soups of all kinds. This is going to be put on my must make list...at the top. Thanks for sharing, Kitty. Soup is the ultimate comfort food, loving this recipe! And your table is beautiful Kitty. Those little red bowls are adorable! Your soup would be perfect for this cold rainy day, it looks delicious. Thanks so much for sharing with Full Plate Thursday and have a fantastic day! This sounds delicious! It's not terribly cold here but I am easily chilled and always turn to soup to warm me up. This would definitely do the trick! Who doesn't love lasagna??!! I can't wait to try this!